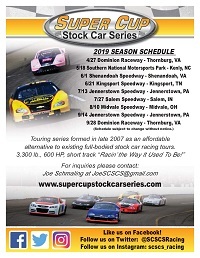 Statesville, North Carolina (September 26, 2018) – Several trophies may have been awarded two weeks ago, but multiple accolades remain within reach this weekend at Dominion Raceway before Super Cup Stock Car Series teams call it a year and regroup over the winter months. The main course being served up during the Duels at Dominion presented by Racing Radios will be the extremely tight chase for the Southern Division title. 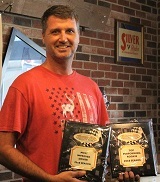 North Carolinians Bob Schacht and Ben Ebeling have been on top of their game in all of the four south-denoted races to date, each winning twice and finishing no worse than third. 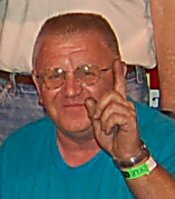 Schacht has a slight edge of five points on Ebeling, and has never lost a race in which he has participated in at the 4/10-mile speedway. 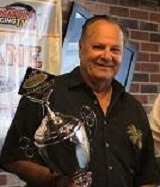 Ebeling has also contended and led laps, and the Kingsport Speedway two-time winner from June will be prepared to do so once again as the match between the No. 75 Engineered Components / PODS / Bob Schacht Motorsports Chevrolet and the No. 44 Startown Carpet and Flooring / SwannysAutoSales.net / Battery Specialists / Potter Racing Ford could likely come down to which driver is ahead when the first checkered flag flies. With an outside shot are Stephen Cox and Mike Potter, who would need both Schacht and Ebeling to have a really off night in order to leapfrog them for the championship. Cox looked to be on the fast track back into contention last time out at Jennerstown, substituting the points earned for the race missed at Dominion in April. Unfortunately, a still undiagnosed problem caused the Indianapolis, Indiana driver’s No. 21 STA-BIL 360 Performance / Impact Race Products / CR7 Motorsports Chevrolet to snap around while leading the event. Johnson City, Tennessee veteran Potter has shown remarkable consistency throughout 2018, but will no doubt be seeking his first career win more than ever after being within inches on the white flag lap in the final race of the night earlier in the month at Jennerstown Speedway. With the points getting settled during the first duel of the evening, bragging rights and a further tune-up for 2019's appearances at the Thornburg, Virginia facility will be at stake for the final feature of the year. Coming to Dominion with momentum on their side and only a goal to conclude the year with a victory at the top of their list include series veterans Kevin Kromer and Brent Nelson. Kromer locked up the Northern Division championship at Jennerstown and was impressive in a recently purchased new ride. The No. 77 Lehigh Valley Cancer Institute / Mission R.A.C.E.R. / Warren Pallet / K2 Motorsports Toyota will look to replicate shades of success seen when racing his past car at a track the Walnutport, Pennsylvania driver has led laps at in order to achieve his first victory since 2014. 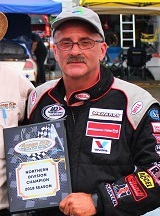 Petersburg, West Virginia’s Nelson has won three of the last four SCSCS races in his No. 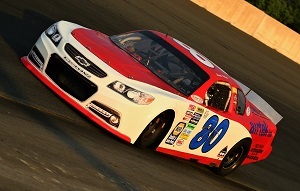 80 Royal Purple / Airtek Inc. / Steam Turbine Services / Precision Auto Collision / Atkinson Welding Chevrolet and had also led the way at Dominion during the most recent appearance in August. 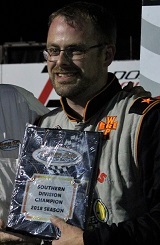 2014 SCSCS champion JJ Pack will be returning to his home track in the No. 90 ride he piloted at Midvale Speedway earlier in the season as well. As an added incentive, the format for the second duel of the night will consist of a race within the race. A special trophy from Extreme Awards & Personalization will be up for grabs to the highest finisher who has yet to previously win a SCSCS event. Some drivers in the running have shown they can contend by leading laps and finishing in the top five on multiple occasions. Ron Langdon returns to the site where he has performed well but certainly luck has not entirely been on his side. 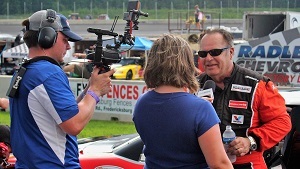 The Freeport, New York racer hopes to parlay a fourth place run at Jennerstown into a potential win for the No. 17 National Appliance / Langdon’s Automotive Chevrolet this time around. Series regulars Marc Jones, Jason Schue, Lauren Butler, Larry Wilcox, and twin brothers Landon and Hayden Brothers will be on hand to see what they can do in regards to accomplishing a respectable finish and conclude their year on a high note. A few additional newcomers to the series are also possible. The Sopwith Motorsports Television Productions crew will be filming and producing all the action for future premiere on MAVTV. Details regarding dates for these nationally televised broadcasts will be announced at a later time. First SCSCS practice is slated to begin at 1:00 p.m. with qualifying taking place shortly after 4:00 p.m. A Meet and Greet with the drivers will be part of the pre-race festivities with the first of the Duels at Dominion presented by Racing Radios set to go at 7:00 p.m.
An optional open practice session will be offered to teams from 4:00 to 8:00 p.m. on Friday as well. 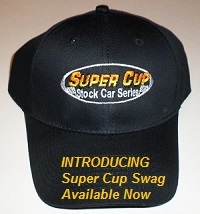 For a complete weekend schedule and more information please visit the official web site at www.supercupstockcarseries.com. Interactive updates throughout race day will be available on the Super Cup Stock Car Series Facebook, Twitter, and Instagram pages.